Bugs and Birds; two of my favorite subjects that have consumed many hours of my time in my 60+ years and both of them still have a tremendous fascination for me. If you are a fly angler I presume that they have a certain fascination for you, but perhaps I can encourage you to develop an even greater interest since I am certain that it will increase your enjoyment and success when you're fly-fishing. Several years ago I wrote a series of articles entitled 'Streamside Companions' that focused on some of the creatures that one might encounter while spending time afield pursuing our favorite sport. 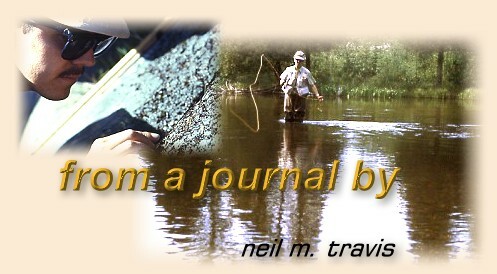 Since I am a firm believer that fly-fishing is really less about the fishing and more about the experience of being outdoors I wrote those articles to encourage my fellow anglers to take time to stop and smell the roses. Life is short and it behooves all of us to make the most of every opportunity that God gives us. In addition, attention to these things may just enable you to increase your ability to fool a few more fish. A body of water; whether it is fresh, salt, or brackish, whether it is a stream, pond, lake or ocean, is a potential source of food for many creatures. For fish it is their environment; the place where they live, breed, and die. Aquatic environments are some of the most biologically diverse habitats on the planet, and they support a dazzling array of plant and animal species. This provides food for many forms of life, including man. For the angler observation is the key to success, and the most observant anglers are usually the most successful. When keen observation is combined with experience and knowledge the combination is true poetry. For the trout angler the most important birds are fly catchers, especially swallows. There are several species of swallows, and they are found throughout North America, even as far north as Alaska. Depending on your location swallows can be found skimming over your favorite trout water starting in early April and by mid-May they will be found in abundance over their extensive range. Swallows consume insects on the wing, and by watching these birds it is often possible to predict if there are insects that are hatching or have hatched. Swallows are social birds and normally they congregate in large flocks when feeding. They like to sit on electric lines and fences when not feeding, and if you see most of the swallows just sitting around it is unlikely that there is much insect activity. If the birds are skimming low over the water or even occasionally striking the surface it is likely that insects are hatching. If you are unable to detect any insects it is likely that the hatch consists of small mayflies, caddis, or midges that you cannot see unless you get right down on the surface. Many times swallows have tipped me off to a hatch that I could not see. This is particularly true when midges are hatching, especially if they are very small or light colored. When waiting for a spinner fall observing swallows is very helpful. Many species of mayfly spinners have mating flights that start high up and gradually drop down toward the stream. Unless the insects are quite large it is nearly impossible to see the mating swarms until the insects start hitting the water. By watching the swallows the knowledgeable angler will know that the mating flight is happening long before they actually begin to hit the water. This will allow ample time for you to get in position so that when the flies begin to fall to the surface you are ready to take part in the action. There is one other benefit in watching the swallows when waiting for a spinner fall. While you may believe that conditions are perfect for a great spinner fall the insects may have other ideas. On more than one occasion I have waited for a spinner fall that never occurred, and by watching the swallows I have been able to either change my location or simply call it a day. Sometimes when I think a spinner fall should occur I may visit several different locations to check on the activity of the swallows. A spinner flight may not form over one area but carpet the water just a short distance away. If I know the area has lots of swallows but I don't see any activity where I am I go looking until I find them. More than once this has allowed me to fish a spinner fall after everyone else has left the stream. Although not as reliable as swallows, in areas where there are lots of bats they can perform a similar function. Being strictly insectivorous and feeding exclusively on the wing they quickly take advantage of dense swarms of insects. Bats flying back and forth in a specific area may provide the angler with a clue as to where a late spinner fall may be occurring. For the salt water angler a different type of bird is often helpful in finding feeding fish. Gulls, terns, cormorants and pelicans are just a few of the birds that feed on small bait fish. Often these small fish are forced to the surface by larger game fish and this attracts the birds. Gulls and terns are especially noisy, and when the angler observers a flock of these noisy seabirds circling and diving into the water it often indicates that game fish are pushing bait fish toward the surface. By dropping an appropriate bait fish imitation into the area near this activity the angler is almost assured of action.